Know in detail the product, as was done or what he provides! View or Download Presentations There are 16 products. 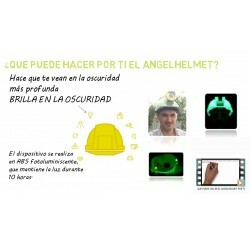 Video Angelhelmet "Close your eyes"
Video Angelhelmet "Close your eyes" Video of the Angel Helmet solution "Close your eyes" in this video you bring them into the skin of a miner, press play and devatted in two minutes the scope and contributions of our safety solution. 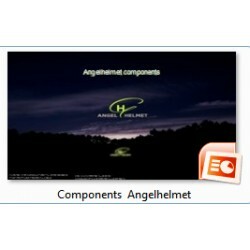 Presentation Angelhelmet "Thinking a minute"
Presentation Angelhelmet "Thinking a minute" In this presentation of the product we are called think of people for a minute, it is surprising to discover the statistical study that was performed. We know that many more people than we think they might need the Angelhelmet to be sure. 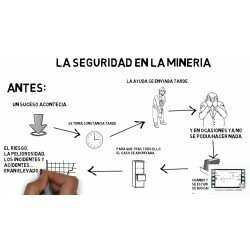 Animated Presentation "Safety in Mining"
Animated Presentation "Safety in Mining" Presentation that explains how to work in a mining generally to an incident or accident, to explain how it would be after the performance in the same position with thissafety solution, our Angelhelmet . Presentation "how the Angel Helmet born"
Presentation "how the Angel Helmet born" Presentation explaining how the helmet Angel was born and phases that has been passed along almost four years of development to become a reality today. 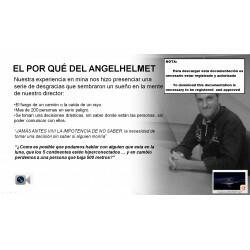 Presentation "What can to do the Angel Helmet for you" Presentation that clearly exposes us each and every one of the security systems it has, and how it communicates with the worker, introducing examples, photos, explanations, notices sent to workers by the RTLS Angelhelmet (motor positioning in real time) etc. Presentation "Angelhelmet Components" In this presentation, the location of each safety system in the device shown, the situation of fixations, ribbons, caps, accommodations, etc. Instructions with pictures that tells us how we have to proceed to obtain permits to download all available documentation and have support.